The missing section was found burnt on the ground. The power company says the ground wire (visible across the gap) was probably arcing to the pole and lit it on fire. They see this happen 3-4 times a year. The main 6 lines are 115kV transmission lines, and the lower 3 are 13.8kV distribution. 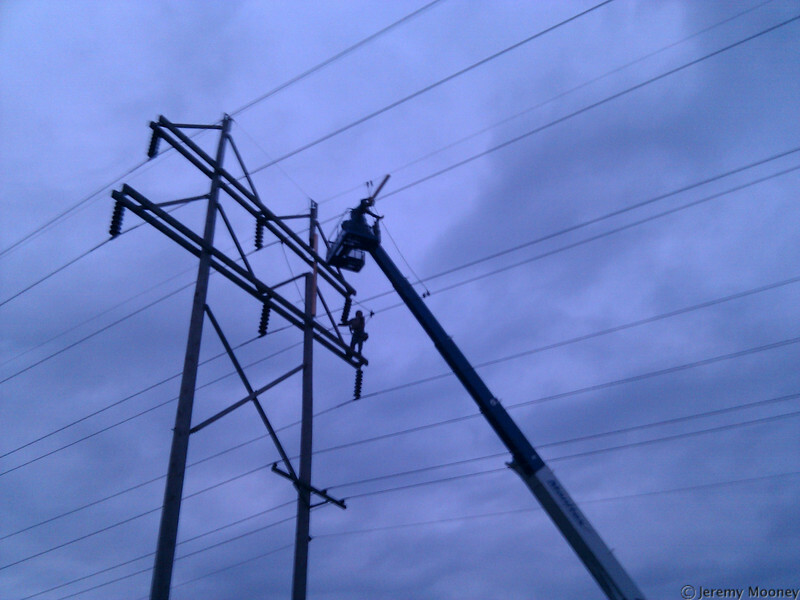 The 13.8kV lines are on a one-shot breaker, so they only shut down the closer 115kV for this repair. This repair is to stabilize the pole until the entire frame can be replaced in 4 days. Unfortunately I heard about this right before I left work and headed straight over, so I only had my cell phone's camera (N1).